Coming Soon! Brand New Home For Sale at 4225 Sleaford Road! WALK TO BETHESDA!!! Another Arts & Crafts masterpiece built by Douglas Construction Group (voted Best Green Builder (2012 & 2014) & voted The Face of Custom Homes (2016 – 2018) & voted Best Builder (2018) – by Bethesda Magazine readers). Brand new Chris Lapp, AIA transitional design and open floor plan boasts over 5,250 finished square feet on 4 fully finished levels. 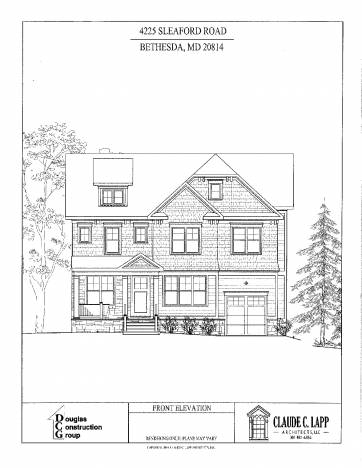 6 bedrooms, 5 1/2 baths, mudroom with walk-in pantry, great room with fireplace and built-ins, study on first floor, gourmet kitchen including huge island with seating and separate breakfast room, master suite with spa-like bath, and so much more….Too many DCG inspired finishes to detail. Back end of the East Bethesda community, and all that has to offer! Time to customize – this one will not last. Floor plans are listed below. Estimated delivery date: Spring 2019.